This is a sample entry from Brian Cullen’s email newsletter, The Cullen Outlook, published on September 04, 2012. 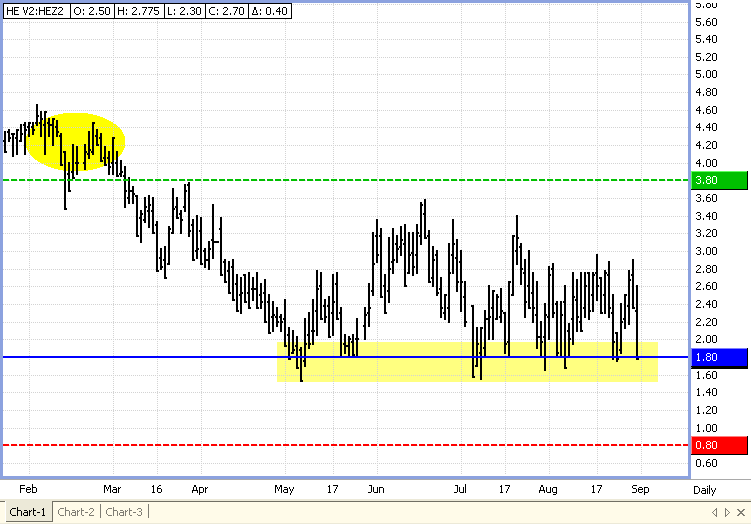 I am looking to get long the front month Lean Hog market (October) while shorting the back month (December). We have seen quite a bit of selling over the past 3 weeks and I believe this market will find support somewhere in this low 70’s trading range. Higher grain prices have definitely had their influence on this market and as we head into harvest I believe this sell off comes to an end. This seasonal spread has found continued support at the 1.60 to 1.90 range over the past 4 months and I would like to get involved as we begin to trade in this range once more.